You heard the news right! 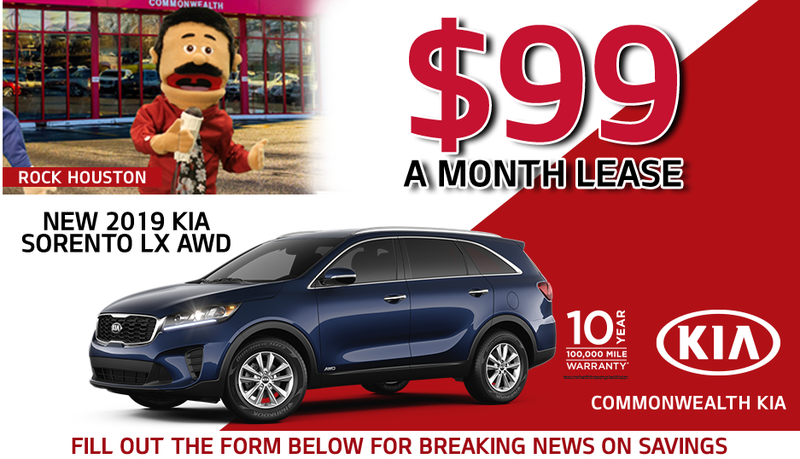 A brand new 2019 Kia Sorento LX All-Wheel Drive is yours for only $99 a month* for 24 months when you lease from Commonwealth Kia in Lawrence, MA. Expert automotive agents are standing by to lead you to this summer offer. Beat the rush and hurry in today to claim your savings! For more information, fill out the form on this page. The midsize SUV takes you around town or on the trail with its Dual Overhead-Cam 2.4-liter 16-valve inline-4. You can count on an EPA-estimated 26 MPG on the highway and 21 MPG in the city, backed by 185 horsepower and 178 lb.-ft. of torque. The Dynamax™ All-Wheel Drive relies on sensors to monitor the environment and send power to the appropriate wheels so you maintain maximum control and traction. Up to seven riders can relax on seats covered with cloth that is easier to maintain because of a special fabric treatment. Adding flexibility for carrying people or cargo are second-row seatbacks that fold in a 40/20/40 split and third-row seatbacks that fold in a 50/50 split. Control infotainment services through the responsive 7-inch touchscreen display. You can even enjoy your music on a speaker system that consists of four in-door speakers and two tweeters mounted on the dash. The Vehicle Stability Management ensures that you maintain control of a smooth ride. When you need to stop, Electronic Brake-Force Distribution sends the correct amount of braking pressure to each wheel. Protecting you during accidents are multiple airbags and crumple zones in the front and rear. You can activate the Locking Center Differential to improve low-speed traction on uncertain roads. *Lease a New 2019 Kia Sorento LX AWD LEASE MSRP $30,435, $99 a month for 24 months. Plus tax, title, and all applicable fees. 12,000 miles per year. For well qualified lessees. Not all customers will qualify. Lessee responsible for excess wear and mileage. Additional per mile charge over 12,000 miles per year. $3,995 cash due at signing. $0 security deposit. See dealer for details. Offer expires 3/31/19. ***Warranties include 10-year/100,000-mile powertrain and 5-year/60,000-mile basic. All warranties and roadside assistance are limited. See retailer for warranty details.